NO POWER sonic interface designs for outdoor star gazing. 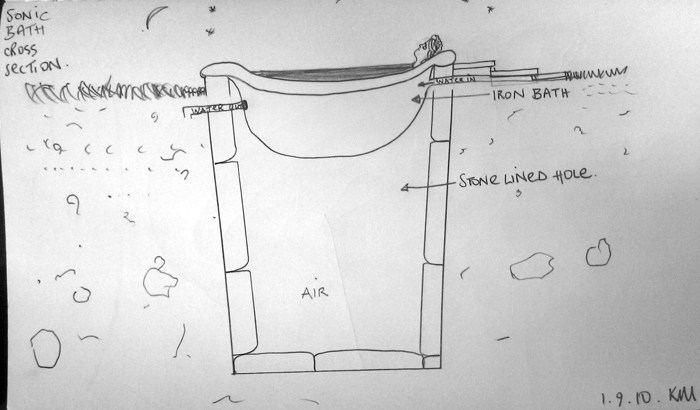 Sonic Bath will be an iron bath suspended over a stone lined hole of 3m depth, filled with water collected in a rain barrel on the roof of the YMS shelter, heated from the YMS stove. Bath will therefore need to be downhill from the shelter, see below. 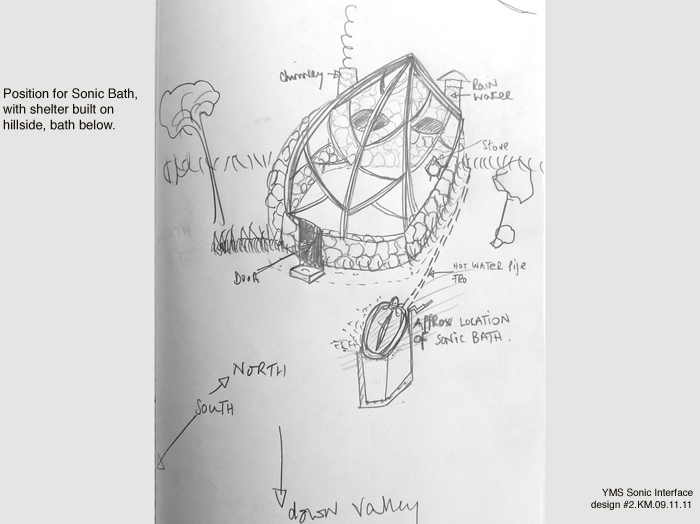 Bath will also be covered with a rubber seal with central slit through which the naked visitor will be able to slip to lie immersed in the hot water, sympathetically vibrating through the visitor’s play of two large mechanical tuning forks immersed in the bath’s structure. Music to feel through the resting body whilst gazing skywards. The mechanics of the fork system to be investigated. Silent holes for star gazing will create individual listening spaces for visitors. Comfortable silent spaces that will enable a complete engagement in the contemplation of the skies and beyond. Being deep in a Scottish forest, any proposed site for a YMS shelter was found to always be noisy with the sound of running water, and at any time of year. 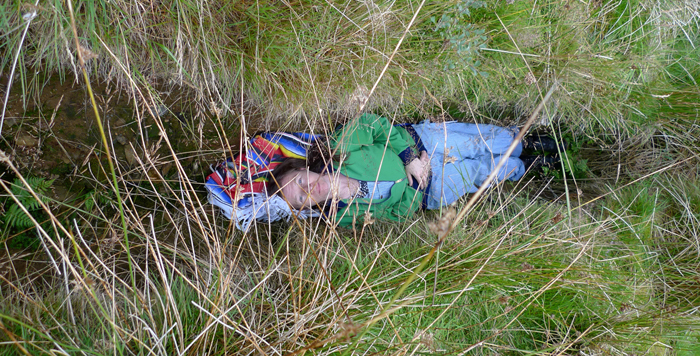 Matthews wanted to create a silent space within the earth for gazing and proposed digging body sized holes in the ground to lie in. After successful experimentation on site, (where it was found that by lying in the ground, not only is a profound feeling of rest and calm induced, but that the forest does go silent) , it was proposed to dig four silent holes for gazing facing North South East and West around the shelter.